Oil on panel, 28 x 33 cm. This small painting is a late work, rooted in the artist’s early production. The composition is calmly and harmoniously divided between the light and dark colour surfaces and fields. Isolated from the rest of the company, a tavern guest sits in the foreground with a clay pipe in one hand and a stone mug in the other. Lost in his own thoughts, he looks into the mug with an almost despairing look as he blows smoke out between his lips. The painting is kept in soft brown nuances, the paint layers are thin and the varied brushstrokes apparent. The style is toned down but expressive, and the painting has many fine details such as the depiction of the man’s untidy hair under the beret and his distinctive face. In the very back of the room over the fireplace hangs a drawn portrait with the inscription 1668. The artist has signed the painting at the bottom right. David Teniers the Younger was one of the leading figures in seventeenth-century Flemish genre painting. He was trained in his father’s workshop and was active in his native town of Antwerp until 1651, where he was employed as court painter to the governor in Brussels. Here he executed paintings with historical subjects and portraits of the court members, as well as managing a cabinet of curiosities. Teniers is best known for his light and charming folk depictions, kermesses and tavern scenes, which particularly contributed to his success in his own time. Often they are kept in a muted palette of taupe nuances broken by individual colour fields in dusty green, yellow, red or blue. 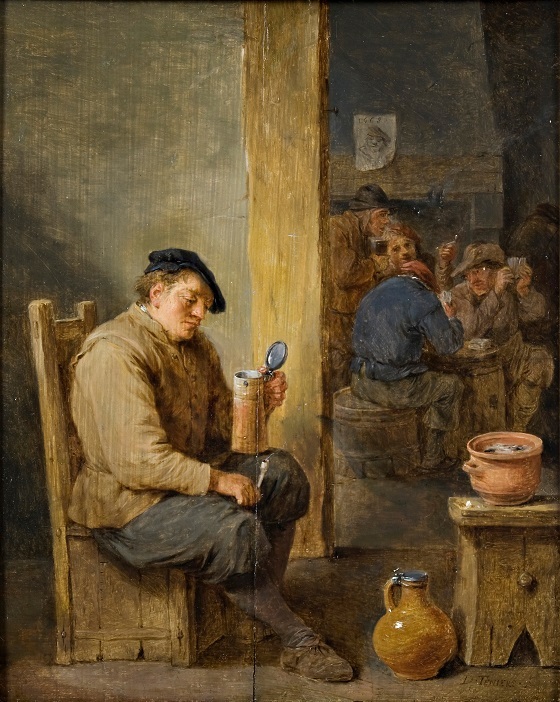 He was highly knowledgeable about Dutch art, and his paintings are related to the works of genre painter Adrian Brouwer, that also primarily depicted quiet farm and tavern interiors.